Edited 5/1/09: Welcome from Kelly's Korner, Show Us Where You Live Friday! Since I had already posted about my kitchen, I thought I would just link back to it. We custom built our house and moved in last August. There are many more photos of the house if you want to take a look at other posts. Most of the completed house pictures were posted in November. Have fun and thanks for stopping by! Today we get to tour the kitchen, breakfast area and office. Please bare with me, there are quite a few photos of this area. There is so much to show you and I wanted to highlight every possible angle. Sorry it's a bit long, but I hope you enjoy. So...let's get started! Isn't the kitchen just beautiful? I am standing right now in front of the TV, looking into the kitchen area. Here you get another glimpse of the trey ceiling in the family room. Like those pendant lights? I do. And I must give ALL the credit to my wonderful husband for picking those out. He did a great job. See the arched doorway? That leads to the hallway where Rachel, Rebekah and Nana's rooms are. You'll have to come back soon to see those photos! Here I am standing in the archway of the dining room, looking into the kitchen. You can see our two islands. The longer one we call the bar and my favorite, the little black island in the middle. The girls like to pull their stools up to this island and help me cook. It makes for a nice work space. Another view of the large island/bar. You can see in the background the breakfast area and office. This bar has been great. One thing I love...it makes a perfect spot for folding clothes. I can stand there, not hunched over, watch TV and fold all the laundry. It's great for those long towels too. We have outlets on either end of the bar and one on the small center island. 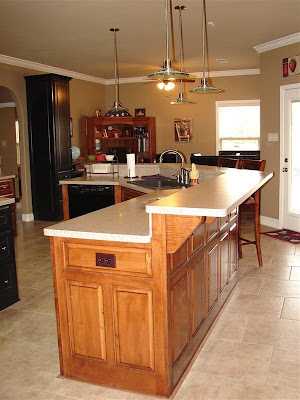 Another view of the center island and counters on the back wall. I have so many cabinets and I love every one of them. And, instead of having standard cabinets below the counter top, we have all drawers. I love this! It makes for easy access to everything and no standing on your head to get something out. 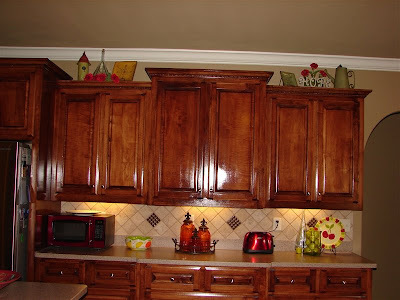 And another view of the cabinets. Like the decor on the top? Thanks to my sister Cynthia for that. She has a great touch and makes everything look so nice. She did make me get a new toaster. She said my big white one just didn't look good. Ha...I agreed and it was getting a bit temperamental. So, I got a nice, shiny red one! Now we are standing right at our back door, looking into the kitchen. You get a good look of the corner of the kitchen, where my wonderful pantry is. I'll post some photos of the inside of the pantry on another day. This post is long enough without it. So come back! I had to include a shot of the bar and bar stools. The girls love to eat up there. And it makes for easy clean up being so close to the sink! 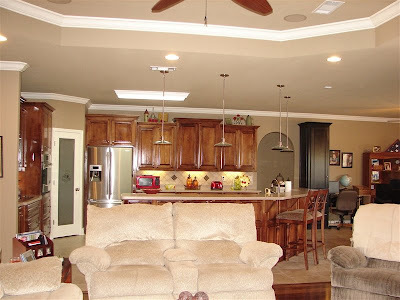 You can see how that area is close to the family room. The girls can sit there and easily watch TV or be a part of whatever is going on. Taken from the breakfast/office area, here you can see another view of this half of the kitchen. See the cabinet drawers on the bottom there? Love them! I already said that, didn't I?!?!? Ahhh...now to the heart of the kitchen. The area where all the cooking takes place. I love every part of this area. The wall oven is the best. I did go with the convection oven. You can convection bake or normal bake, but I find myself using the convection more and more. I really love it and it cooks everything so evenly. Yeah, the top of the cabinets...thanks again to my sister Cynthia! I have always wanted one since they came out, but I finally got one in my new house. And that is the smooth top cook top. It is so nice to cook on. It even has a power boil burner that brings water to boil fast! 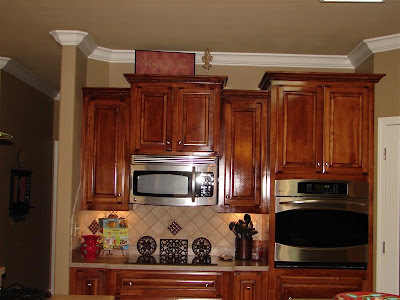 You can see here, and in some previous pictures, but the tile back splash turned out great. It wasn't exactly what I wanted, but I like how it turned out. I love the tiles turned on the diagonal. It makes it interesting to the eyes! Oh, those tall cabinets on the bottom on either side of the cook top...those both pull out and have special shelves in them for holding spices! I really like them. Above the wall oven are those divided cabinets that hold your cookie sheets, stones, and other tall items. And yes, I love them too! And there to on the left is the hallway that leads to the cubbies, laundry room and garage. More photos of those to come soon! Here I am standing in front of the pantry door looking towards the back door. You can see our black sink and the dishwasher in this photo. You can see too that I have a great view out the back to keep an eye on the kids while they are playing. Almost done...here is our breakfast area. This is a new piece of furniture. We love it and the girls say it is like we're eating at a restaurant. It fit great in the space we had and we still have room for our office. There was one more chair, but we have it stored in the dining room right now. We only need five spaces on a regular basis. We can pull out that sixth spot when needed. The windows look out onto the deck and backyard. And here is our office. This is where I work and we were able to fit the girls computer in there too. We want their computer out in the open, so this was a perfect place for them. Right now Rachel is really into playing on buildabearville.com and Rebekah likes to create her own fairies on some other site that I can't think of the name of right now. What's that? You want to know what that tall black cabinet is for? Well, let me tell you! 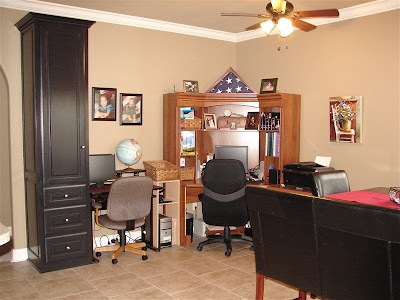 It is a built-in cabinet that I wanted to have to store all the kids arts and crafts supplies. The top part has shelves in it and has worked great to store all their stuff. I use the drawers for my office supply type stuff. I had the cabinet painted black for two reasons. One, to match the small center island. Two, to break up the space. I wanted to separate it from the kitchen area. I think it worked out well. 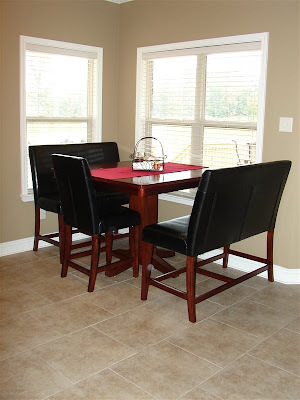 Plus, the black in the new breakfast table furniture helps tie everything together. OK, that's all for today. Lots to show you, so come back tomorrow for another tour! I also love the staggered look. I don't know if you noticed this or not, but the are staggered in height and in depth. 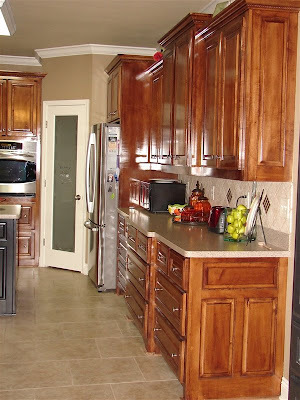 The cabinets that are the highest are also the deepest. Really really cool! And yes, the refrigerator has ice and water in the door. It was one of my main requirements. It's a Samsung. I love everything about it and I LOVE your island. That is different and beautiful!! I Love it. Makes me want to spruce mine up a bit. I love your kitchen and how it is set up!!! We are about to start building and your kitchen is what I have been imagining in my head. Thanks for sharing!! 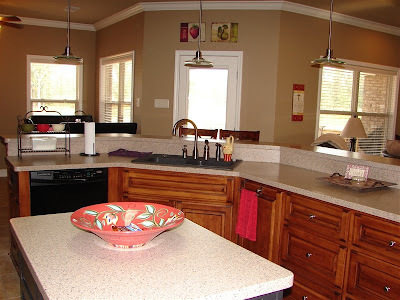 Your kitchen is phenomenal! I think I would sleep in it! Thanks for stopping by my kitchen :)! 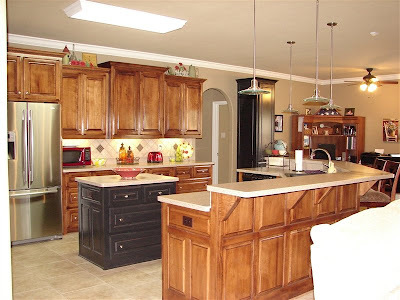 You have a beautiful kitchen as well. I really love the openness. To answer your question, I only keep things up there that I rarely use :) I just the like the look of them so they are more for looks rather than function. You have a warm, inviting home...thanks for the tour! You have a dream kitchen. I am soooo in LOVE with your pantry door!!! Thank you for opening up your home! BEAUTIFUL! 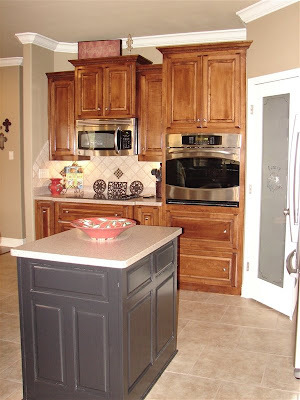 I LOVE THAT TALL BLACK CABINET AND THAT BEAUTIFUL PAINTED BOWL ON YOUR ISLAND! SINCE I OWN A PAINT YOUR OWN POTTERY STUDIO, I FIND THE HAND PAINTED STUFF IN ALL THESE KITCHENS SO MUCH FUN TO LOOK AT! TAKE CARE AND THANKS FOR SHARING! I love the black mixed with the stained wood! Beautiful kitchen! Hey! Thanks for sharing! I LOVE that little black island! I need something like that in my kitchen! The previous owners had a small island, but took it with them when they moved! Very pretty kitchen! I love the black island! Thanks for sharing! Love the idea of folding clothes at the bar! Also, that's a great idea to have all drawers under your countertop...I'll have to remember that! Thanks for letting us see! Love all your Southern Living At Home pieces! I've been a consultant for over 3 1/2 years, so I'd recognize a Bountiful Bowl and an Estate Trivet Trio anywhere :) Gorgeous kitchen! you have a lovely kitchen. love the kitchen drawers instead of cabinets. 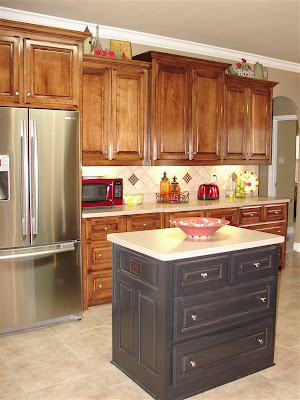 just curious why you didnt match your island to the rest of the cabinet colors? was that the only color available or something? it seems to stand out in a kitchen that otherwise matches very well. I like the offset of the colors. The pictures in this post don't do it complete justice. The black is more vibrant than in the photos. I think the flash dulls it a bit. And something you can't really tell from the pictures is that my counter tops have tiny specks of black and the other cabinet colors in them. It really stands out in person. I also like the black accents, it pulls the appliances together too. Very cute kitchen... 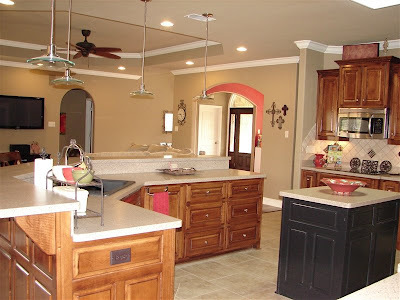 I'm getting new grantie counters and a travertine/glass backsplash in my kitchen next week and can't wait!! 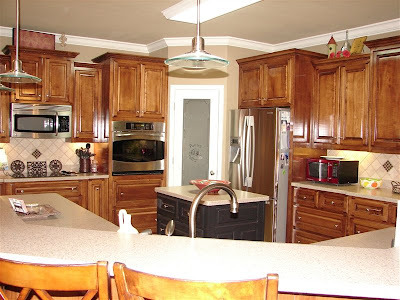 I saw your kitchen on Kelly's Korner and loved it. Can I ask you what color paint is on your kitchen walls? 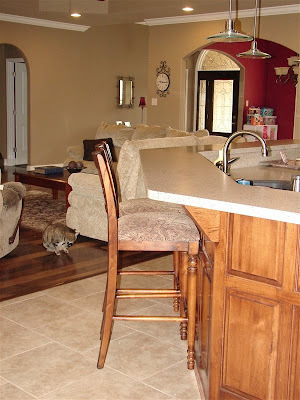 It looks like I have the same kitchen tile floors as you, and I love the way your wall paint looks with them! Matthew, I wish I could help you with the paint color. It was actually a custom color I had mixed from a paint can lid I found at an office building that was being painted. I feel in love with it and knew that was what I wanted for my house. I don't know if their computer databases are nationwide, but it was mixed at Sherwin Williams and they named it Jenn Tan. Thanks for the comment!